A water treatment group now being established in Australia will this year complete delivery of a large water screening system, being installed into a major sea water intake infrastructure project in Qatar. Eimco Water Technologies was awarded the contract to provide the technology for phase II of the project in the industrial city of Ras Laffan, says Eimco Water Technologies’ Australian managing director, Michael Froud. The technology has strong relevance to Australian power, oil and desalination projects, says Michael Froud, whose parent group GL&V has approximately 1,800 employees globally and is present in 40 countries on six continents including Australia, where its Eimco Water Technologies office has been expanded over the last year to accommodate new technologies. Under the terms of the Qatar contract, Eimco Water Technologies is scheduled to deliver by June this year an absolute water screening solution comprising several pieces of equipment, based on the Brackett Green technology for high-volume water intakes. “On completion of the project, the screening facility will be larger worldwide, as it will treat more than 200 tons of seawater per second in order to supply a power station, an oil refinery, a seawater desalination plant and several other industrial facilities located in Ras Laffan with process water,” says Michael Froud. 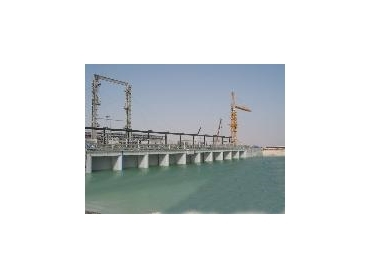 The water screening systems included in phase I of the Ras Laffan seawater intake project, completed in 2003, were delivered by Brackett Green Limited (Colchester, United Kingdom), acquired by Eimco Water Technologies parent group GL&V in November 2005. A third phase is currently being planned. Michael Froud says the contract is a larger one ever awarded to Eimco Water Technologies, as well as to the former Brackett Green company. Set up in April 2004, GL&V’s Water Treatment Group (Eimco Water Technologies) has achieved revenues of more than $A130 million a year and is expected to experience further growth driven by acquisitions and organic development. The expansion into Australia is part of this growth, says Michael Froud. Eimco Water Technologies specialises in the development and global marketing of equipment used for treating domestic and industrial water and wastewater, as well as large scale water intake and industrial effluent. Eimco Water Technologies brings together in one organisation in Australia the experience and know-how of eight of the well known names that have been recognised in the water technology industry for more then 100 years (including Eimco, Dorr-Oliver, Brackett Green, Jones & Attwood, Copa, Enviroquip, Wemco and Caird and Rayner Clark). Eimco Water technologies announced last month that it is introducing to Australia an advanced hydro-optic disinfection (HOD) process that is environmentally friendly and leaves no disinfection by-products. Atlantium out-of-the-water UV disinfection systems that are used to treat water and wastewater involved in industrial, energy and municipal processes, including food and beverage groups. Eimco Water Technologies is the distributor for Atlantium Technologies, which have already been adopted by some of the world’s well known food and beverage manufacturers including major Australian companies.